Unboxing the Best of Leicester. I remember growing up and having absolutely no interest in my home city, I thought it was a place of complete boredom and would have happily been outside the city at any given opportunity. However when I returned from Coventry after spending 3 years there for university I couldn't wait to get back to Leicester and ever since I have been discovering more about this little city of mine that I've learnt to embrace every corner of. Leicester is the city of the 2016/17 Premiership Football Champions, where King Richard III's body was found under a car park, the birthplace of local Radio, the biggest outdoor, covered market in the whole of Europe as well as much more. What I didn't know until recent years, mainly thanks to blogging was that Leicester also hosts a lot of independent businesses amongst the bricks. Gelato Village on St Martin's Square brings real Italian Gelato to Leicester. bringing the real authentic flavour of a well loved Italian treat and is the place you must go place for a dessert. It's ingredients are of the highest quality to provide the best of the best, without using artificial preservatives, flavourings or emulsifiers. This makes sure that the Gelato is made as it's most natural state, meaning it's lower in fat than your average ice cream. Their milk and cream is sourced locally from the rare breed Red Poll cows at the Belvoir Ridge Creamery near Melton Mowbray, a short drive from the city centre. There is a huge variety of flavours on offer and the team are always constantly experimenting with new and exciting combinations for their customers. My favourite by far is their take on Hazelnut which was introduced to me by Kirstie from BehindtheScent as well as the trusty Milk Chocolate Fudge, The ice cream is always fresh, never selling anything that is over 72 hours old and their staff are so overly friendly. If it's a cocktail bar your after for a cocktail in an environment which makes you feel classy and relaxed then look no further than Gelato Village's neighbour, 33 Cank Street. They honestly serve up some of the most intriguing cocktail recipes that are different to what I've had before. Their Candyfloss cocktail is a huge hit for me and my local blogging friends, made with a J&B rare blend whiskey, fresh raspberries, fresh citrus, egg whites and cankster juice. It comes complete with you guessed it, candyfloss and is a fun but delicious cocktail. The one in the image is their Bosworth Rose cocktail, a tribute to the Richard III. It consists of Burleighs Leicestershire Gin, Campari, fresh citrus, pineapple juice and rose water spritz. If your a lover of Gin like me and looking for a beverage to enjoy with your gal mates then this definitely the one. The bar also shows it's own 'Rhythm and Booze' session every 1st and Last Friday of each month. The night is hosted by their house band The Verzions and guests who play a mixture of reggae, soul, blues, jazz and modern classics from 8pm. You must book to attend but it's free, and with their range of cocktails it'd be the perfect beginning to a night out. When thinking about some of the best bits of Leicester there's one independent business that stands above as one of my ultimate favourites. Bru located on Granby Street (a 5 minute walk from the train station, perfect pit stop before hitting the town centre), offers a specially crafted blend of coffee, freshly made food, gelato and heavenly Liege Belgian as well as my favourite, a whole host of tea blends that range from the standard to the fruity. I love the vibes in this coffee shop, your made to feel welcome in an instant, quickly served and it's also a great space to grab out your laptop or your book, doing what you do best on your own. Having visited here regularly one of my favourite things about Bru is they really enjoy mixing it up with their meal dependent on the seasons, their Christmas menu of both food and drinks is the absolute bomb. Some of my favourite products are their delicious Chocolate Brownie as well as this Ginger Nut styled cheesecake which was perfectly washed down with my standard cup of English Breakfast tea. There's so much shopping available in Leicester with the indoor shopping complex, Highcross. With over 150 shops as well as a great mixture of restaurants as well as a multi-screen cinema it's popular for your retail therapy. Outside the doors of Highcross there is also popular stores TK Maxx, Primark, plus many more in an arm's reach too. I tend to spend a lot of my time working my way through the many stores Leicester has to offer and they aren't short of meeting everyone. Leicester also packs in a lot of shopping independent stores on it's streets too, even some great vintage stores! One of the independent stores that I have been lusting over since I discovered it at a local blogger meet is Divine Boutique. Located in the Lanes area of the city centre this gorgeous two storey boutique has a selection of gorgeous gowns for any special occasion to their first floor bridesmaid suite. I need to find an occasion to wear one of these dresses because they're stunning and the boutique is full of colour and sparkle. Their team offer some great advice on the styles, colour and fit to help you find the perfect dress with the added bonus of their alterations being at no extra cost! 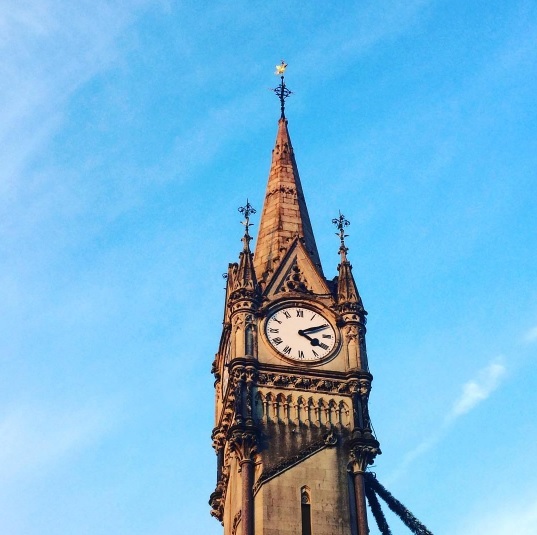 Leicester definitely contains a lot of gems for you to discover too, with so much history around every corner you should really get your walking shoes on and have a look around. A stone throw from the city centre (around 10 mins) is the National Space Centre which is great for a rainy day activity as well as the New Walk Museum which I only discovered a few years back and now thoroughly enjoy wandering around. The city itself also has a whole range of park spaces which are great on a sunny day. One place which is definitely top of the list to check out is the Leicester Cathedral. It's such a stunning building to look at as well as look inside which is free. Inside is the tomb where Richard III's body now lays too. I always love discovering inside Cathedral's because they're always so pretty and Leicester's one is no different. Unboxing your own city is really great fun to do so I urge you to go out and see what's out there, take your camera with you too. Have you been to Leicester? If so tell me what was your favourite thing to do whilst you visited? *Collaborative post with WatchShop . This was part of their Unbox the City project where I revealed the best parts of Leicester.